Email etiquette is very important in regards to succeeding in the business world. 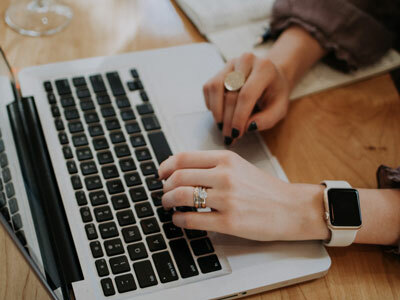 There’s so much that can be misconstrued via email, so it’s up to you to make sure you handle this method of communication in a professional manner. Lea Berman and Jeremy Bernard, authors of TREATING PEOPLE WELL, share 8 tips to emailing like a pro. Sarcasm is difficult to recognize without hearing the speaker’s tone of voice or seeing the smile and accompanying eye roll. Save emojis and overpunctuation for your friends. Messages that are all in capitals denote ANGER. Identify the reason for your email in the “Subject” line, and if you’re emailing someone you don’t know, use salutations that are appropriate, such as “Dear Ms. Smith.” In business emails, use the same format as you would in writing an actual letter. Avoid abbreviations like “thx” for “thanks” so you don’t seem hurried and overly casual. Unless you’re in the middle of a real-time email back-and-forth, you should always use some kind of sign-off at the end of the email, such as “All the best” or “Best regards,” and your name. Adding a standard signature that includes your name, title, work address, and phone number is helpful for those who may want to follow up. #4. Don’t bring alcohol into the mix. Avoid responding to business questions after you’ve had a glass or two. Your reply will lack the coherence and consideration that it deserves, and you may need to walk it back the next day. When you receive a message that makes you upset, take a moment before answering. Remind yourself: Emails are forever. How many of us have blasted off angry responses that were completely out of proportion and lived to regret it? As with handling conflicts, a measured response is better than a rash one. You make more of an impact when you stay calm and marshal your facts logically. Your emails may end up going to people who were not meant to see them or annoy people who don’t need to. Auto-correct, auto-fill, and autoreply can be dangerous. To her embarrassment, Lea once sent an attachment of her joint tax return to a Washington insider because his last name was similar to that of her accountant. If you want to be certain you don’t send an email too soon, leave the “To” line blank until the very last second; this will prevent you from sending a draft before you’ve completed your thought process. It’s fine to send a fulsome thank you via email. It’s not as good as a handwritten note, but it’s better than not thanking someone at all. 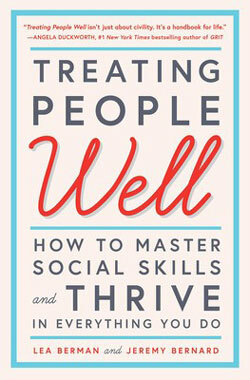 Discover more ways on how to succeed in the workplace and life in TREAT PEOPLE WELL by Lea Berman and Jeremy Bernard. 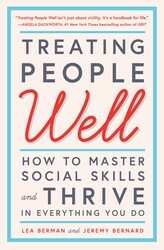 Excerpted from Treat People Well by Lea Berman and Jeremy Bernard. Copyright © 2018 by the author. Used by permission of the publisher. All rights reserved. Two White House Social Secretaries offer “an essential guide for getting along and getting ahead in our world today…by treating others with civility and respect. Full of life lessons that are both timely and timeless, this is a book that will be devoured, bookmarked, and read over and over again” (John McCain, United States Senator).Former White House social secretaries Lea Berman, who worked for Laura and George Bush, and Jeremy Bernard, who worked for Michelle and Barack Obama, have learned valuable lessons about how to work with people from different walks of life. In Treating People Well, they share tips and advice from their own moments with celebrities, foreign leaders, and that most unpredictable of animals—the American politician. Valuable “guidance for finding success in both personal and professional relationships and navigating social settings with grace” (BookPage), this is not a book about old school etiquette. Berman and Bernard explain the things we all want to know, like how to walk into a roomful of strangers and make friends, what to do about a colleague who makes you dread work each day, and how to navigate the sometimes-treacherous waters of social media. Weaving “practical guidance into entertaining behind-the-scenes moments…their unique and rewarding insider’s view” (Publishers Weekly) provides tantalizing insights into the character of the first ladies and presidents they served, proving that social skills are learned behavior that anyone can acquire. Ultimately, “this warm and gracious little book treats readers well, entertaining them with stories of close calls, ruffled feathers, and comic misunderstandings as the White House each day attempts to carry through its social life” (The Wall Street Journal).